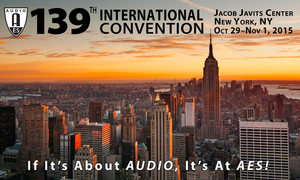 The 139th AES International Convention will have a strong focus on the future as it welcomes the next generation of audio professionals to participate in a full program schedule organized for students. 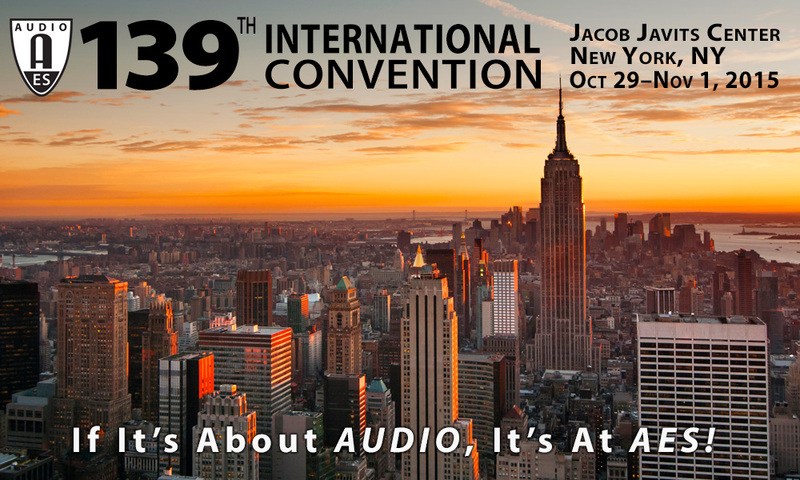 Workshops, tutorials, recording and design competitions, exhibitions and mentoring sessions will all be available to budding audio industry professionals who make the trip to this year’s 139th AES Convention, October 29 – November 1, 2015, at the Jacob Javits Center in New York City. It all kicks off Thursday, October 29 with the first meeting of the AES Student Delegate Assembly. This will mark the official opening of the Convention’s student program and offer an opportunity to make introductions to fellow audio students from all corners of the world. The meeting will announce the finalists in the Student Recording Competition categories and the Student Design Competition, and preview all upcoming student and education-related Convention events. On Friday, October 30 the focus will be on recording in the Student Recording Critiques and the first round of the Student Recording Competition. In the former, students will be able to bring their recordings to non-competitive listening sessions and receive feedback on their projects. Friday’s Student Recording Competition is an AES highlight, where the finalists in each category will play their projects and get feedback from a panel of industry judges. Saturday, October 31 will be jam-packed with student-centric events including the AES 135th Education and Career Fair, which will match job seekers with companies and prospective students with undergraduate and graduate academic programs. All attendees of the Convention, students and professionals alike, will be welcome to offer a resume to participating company representatives. Admission is free and open to all registered Convention attendees. The “SPARS Speed Counseling with Experts – Mentoring Answers for Your Career” session will give students, recent graduates and those interested in career advice the opportunity to interact with working professionals in Q and A sessions in a 20-minute speed group mentoring format. In the AES Student Design Competition participants will be able to show off their hardware and software designs, from loudspeakers and DSP plug-ins to hardware, signal analysis tools, mobile applications and more. Rounding out Saturday’s programs will be another Student Recording Critiques session and Round 2 of the Student Recording Competition. Additional information and a complete listing of student and career development events is available at http://www.aes.org/events/139/students/. For the latest information on the AES 139th International Convention in New York City and how to register for your FREE Exhibits-Plus or premium All Access (deeply discounted for AES Student members) badge, visit http://www.aes.org/events/139/.